As seen in Carlsbad on the way to work this morning. Bring your Wednesday Weed to Work Day? 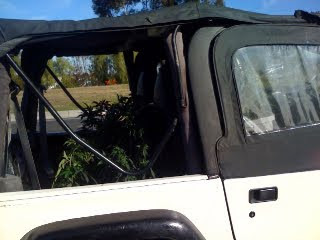 Another plant is sitting shotgun. So... How do you know that is not a simple Japanese Holly Fern? It's obviously a "doctor" making a "housecall" to a registered "patient" with some "medicine".